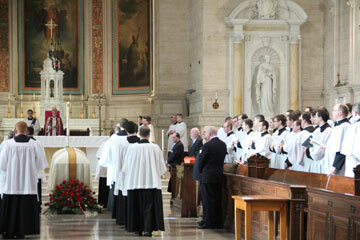 The celebration of a “Stational Mass” for Cardinal Bevilacqua, Mon. Feb. 6; this is a Mass that precedes the final Mass of Resurrection to be celebrated at the Cathedral Basilica of SS. Peter and Paul Feb. 7. 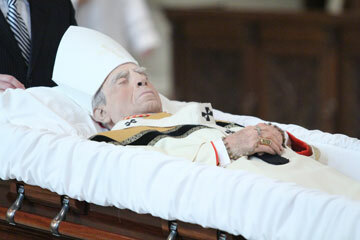 The solemn rites preceding the entombment of Cardinal Anthony Bevilacqua at the Cathedral Basilica of SS. Peter and Paul began Monday, Feb. 6 at St. Charles Borromeo Seminary, his last place of residence, with a private viewing for family, friends and the seminary community. At 8 a.m. the body of the late Cardinal was formally received at St. Martin’s Chapel by Bishop Timothy C. Senior, and the viewing was held following Morning Prayer. Msgr. Shaun Mahoney, rector of St. Charles, remembers the late Cardinal as quiet and appreciative of everything that was done for him. “I celebrated Mass for him a few times, and he was grateful for that,” he said. Elmer “Bud” Hansen, who with his wife, Eileen, support many charitable endeavors in the Archdiocese, especially remembered an incident that happened 15 years ago in February 2001. “My son, Bud and his wife had quads at Abington Hospital,” he said. “They were premature, only about nine and a half pounds among them, and there was a question if they would all survive.” It wasn’t possible to take them to church for baptism, so Hansen called Cardinal Bevilacqua for advice. The Cardinal got into his car and drove by himself to the hospital. On that particular day, the Philadelphia area was hit by an unexpected snow storm, and the roads were clogged. It took the Cardinal eight hours to get there, but he made it, Hansen said. The quads, Michaela Rose, Anna Grace Rose, Chloe Rose (all named for the Little Flower) and Maximilian Kolbe were all baptized, and while the Cardinal was there, he baptized the rest of the Catholic babies in the hospital. The quads are doing fine; they just celebrated their 11th birthday, Hansen said. “You talk about a friend, we thought the world of Cardinal Bevilacqua; he was a great man of God and I never knew him to be anything but a great churchman,” he added. Also there to pay final respects were some members of the team of certified nursing assistants who cared for him, including Felicia Marklin, Tish Chance, Colette Downes and Ocilla Rocke. “A nice man, a good teacher,” “compassionate and caring,” “a wonderful man who treated everybody the same,” was among their remarks about the Cardinal. The seminary viewing was temporarily halted at 11 a.m. for the celebration of a “Stational Mass” for the deceased Cardinal; this a Mass preceding the final Mass of Resurrection which would be celebrated at the Cathedral. Principal celebrant of the Mass was Bishop John McIntyre, and concelebrants included Bishop Daniel Thomas and Bishop Michael Burbidge of Raleigh who was former secretary to the cardinal and former rector of the seminary. There were more than a score of priests also concelebrating including Msgr. Joseph Gentili, Cardinal Bevilacqua’s last administrative secretary and the homilist for the Mass. Archbishop Charles Chaput was also present but not concelebrating. Among the concelebrants was Msgr. John Alesandro, the Cardinal’s oldest nephew. As a matter of fact, the Cardinal, then only a seminary student, caused a bit of an accident in his life. “I was a year and a half, and he was swinging me around I dislocated my shoulder,” he remembers. There are many happy memories, too, and many coincidences. Both became canon lawyers and civil lawyers and both loved music. They would get together to play with friends and other priests. “Cardinal Bevilacqua used to play the accordion,” his nephew said. The two would also sometimes play golf together. “He could have been a good golfer, but his work ethic wouldn’t permit it,” Msgr. Alesandro said. After the Mass the viewing resumed until Vespers at 4:30 p.m., after which Cardinal Bevilacqua was taken to the Cathedral Basilica of SS. Peter and Paul, his final resting place.